PARIS, France, February 6, 2014 (ENS) – Today in Paris, beside the Eiffel Tower, the government of France crushed 3.5 metric tonnes of illegal ivory seized over a period of 20 years by French Customs officers. 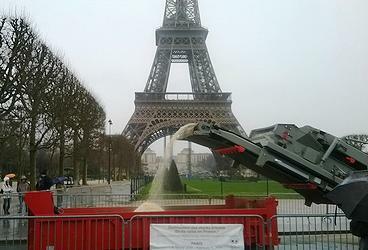 The crush operation makes good on the pledge offered by President François Hollande December 5 in Paris at the Elysée Summit for Peace and Security in Africa to destroy French ivory stocks before the London Conference on illegal trade in endangered species set for February 12 and 13. The crush destroyed more than 15,000 pieces confiscated between 1987 and 2007 from air cargo and passengers by customs officers at Roissy Paris and Orly airports. The ivory crushed was in the form of whole tusks, sections or points as well as worked pieces without heritage value, such as sculpted bracelets, necklaces, rings, statues, figures, or animals. Some of the confiscated pieces will not be destroyed. They were headed to museums or destined for scientific use – uses that are permitted under the moratorium on commercial trade in elephant ivory imposed by the Convention on International Trade in Endangered Species from 1990. With today’s action, France becomes the first European country to carry out public destruction of some of its government-held ivory stockpile. The ivory crush in Paris follows similar destructions of illegal ivory in Kenya, Gabon, the Philippines, the United States and China, and most recently in Hong Kong. Ivory trafficking is constantly increasing across the world and in France. 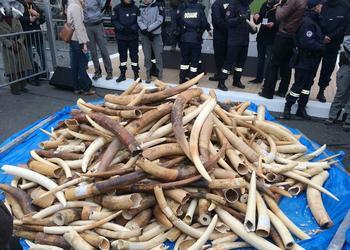 In 2012, French customs seized 346 pieces of raw or worked ivory in 57 separate incidents. One of the largest ivory seizures by French customs agents over the past 10 years took place on December 10, 2013, when agents in the city of Poitiers seized 82 kilograms of smuggled ivory they found in the trunk of a vehicle traveling on the A10. Deforestation, poverty, corruption, military conflicts and an exponential increase in demand from Asian consumers – the causes of elephant poaching and ivory smuggling are many. Ivory trafficking has doubled in five years. according to Environment France, and the latest data from elephant monitoring efforts shows that poaching and trafficking of ivory could eliminate a fifth of the African elephant population within 10 years. The latest census estimates the number of African elephants alive today at between 419,000 and 650,000. In Asia, wild elephant populations are between 39,500 and 43,500 animals and there are about 13,000 elephants in captivity. Gobally, illegal trafficking in all wildlife species is estimated at more than US$14 billion every year. Every year smugglers move 500-600 million tropical fish, 15 million animal furs, five million birds, two million reptiles and 30,000 primates, according to estimates by the organization TRAFFIC, a joint wildlife trade monitoring effort of the International Union for the Conservation of Nature and the global conservation organization WWF, based in the UK. “France’s move today sends a strong message to a European audience, particularly French tourists and businessmen, that buying ivory as souvenirs directly contributes to the elephant crisis we face today,” said Tom Milliken, TRAFFIC’s ivory trade expert. Classic economic theory holds that reduced supply in the face of strong demand could lead to increased prices, a prospect that could stimulate profit-seeking criminals to poach more elephants and traffic more ivory, Milliken pointed out. Next week, heads of state and foreign ministers from some 50 countries will meet in London at a summit hosted by UK Prime Minister David Cameron. HRH The Prince of Wales and his son HRH The Duke of Cambridge will also attend London Conference events. The conference will seek commitments from key priority governments to combat the growing global threat posed by illegal wildlife trading. “But symbolic as they are, destroying ivory won’t stop the devastation of elephant poaching,” said Mansbridge. If we want elephants to be left in the wild by the time our children grow up, we need firm action on several fronts: better protection in Africa, bigger punishment for poachers, mass education campaigns and changes to the law in Asia and a concrete financial commitment from governments across the world. Care for the Wild plans to participate in a demonstration outside the Wildlife Crime Summit on February 13, when animal lovers will gather to welcome delegates to the summit and implore them to ensure action is taken.